I create a multiple choice question for the user to select. Then in next input table, i want to update the corresponding table with the points and then allow the user to input a value so that total points is calculated from the passed value and the input value to the total value. I am ok to not have the max value column but i need to define the upperlimit to total value of each row. If I understand your requirement correctly you want to display the points value from the checkbox to first column of input table field and calculate the total by using 'No. of activities' value which will be entered by the user. If so, since the calculation values are being used in the checkbox field, when multiple options are checked the total can only be sent. So, it is required to have these options/values to be displayed in the Input table manually by setting another condition. Please see the screencast below for setting up conditions for each selection to calculate the totals. Here is the cloned version of your form with the above changes that you may want to take a look. 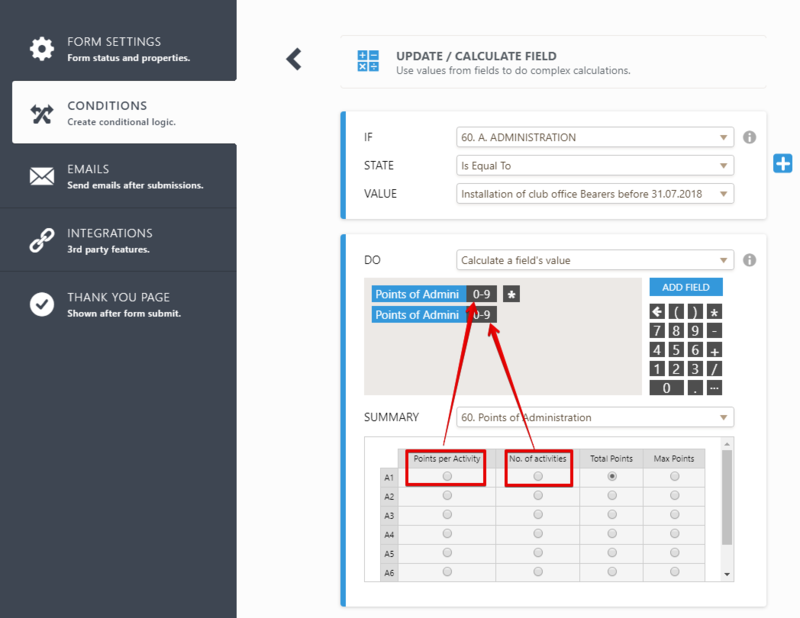 Please refer to the guide below that can help you with performing calculations with input table field. So each of them have a value, i was expecting the calculation to pass that calculated value to the row. THe other question was how to limit the total value? Unfortunately, there is a limit to what calculations you can perform on the input table. I tried to use conditional logic to achieve the maximum value calculated using the conditional logic to no avail. You will need to use separate number fields for each and style them accordingly. I'll also see if this can be done using other spreadsheets like widgets and update you. can we use if then else logic in the calculations? I'm afraid "If Else" is not available when creating conditions. We will be glad to help you with your concern. 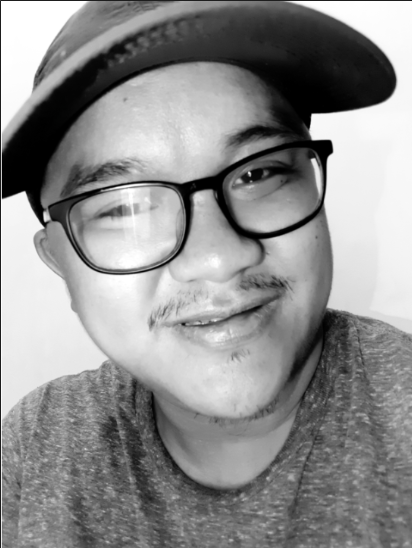 Please allow me some time and let me check if I can find a workaround that will meet your requirements. I'll get back to you as soon as possible. 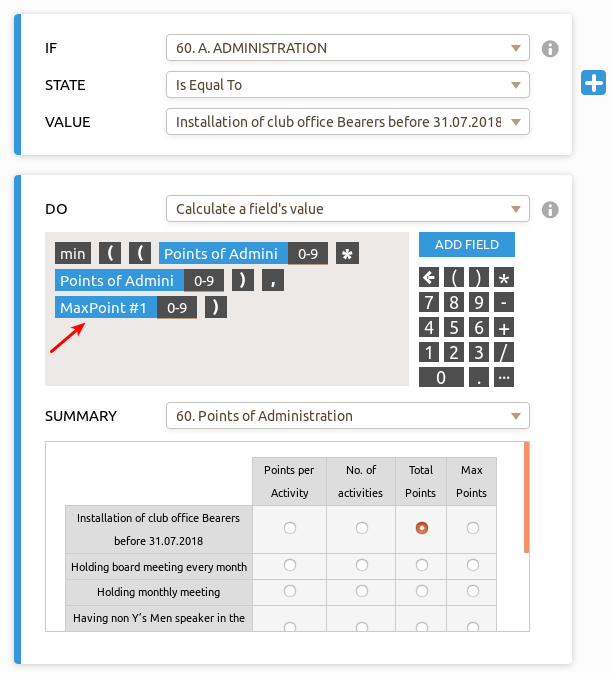 I have checked the form that has the table shown in your screenshot above and I see that you have set up conditions that will multiply the value in the Points per Activity column by the value entered in the No. 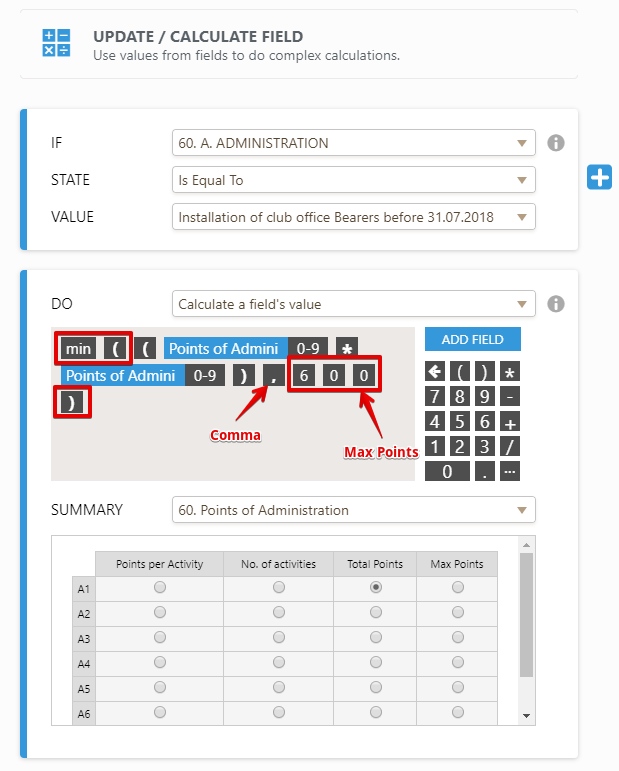 of Activities column on each row of the Points of Administration table. To get the Total Points in row 1. The result of the computation will then be shown in the Total Points column. However, to my understanding, you would like to limit the values in the Total Points column based on certain max points per row that you will set. Which means if the value in the Total Points column is higher than the max points you set, it should have the max points instead. Otherwise, it should retain the current value in the Total Points column. I have a workaround that will meet your requirements. We will have the condition above as an example. You can edit that condition and make it look like the one in the screenshot below. You will do the same on every condition that does the same to get the total on each row. The min() function will return the value of the lowest number in the group. The numbers in the group are separated by a comma. Since you are setting the max points in the condition and since you also mentioned that it is okay to not have the Max Points column, the Max Points column can be removed. You will see that I have set a Max Points of 600 on the first row and 400 on the second. I hope this helps. If you have other questions, please feel free to let us know. This cool, thanks a lot. much appreciated. However i was thinking of another way. Would like to explore that feature. As you may have noted from the form that the multiple choice has feature of calculated value. Is there a way to set condition to have that automatically passed, so that i dont have to painstaking add a new condition for each of these values. Tommorow if i need to change the values i dont have to search that particular condition. it is so huge. I just need to go to that calculated value and update the new value, the formulas will remain the same. Can i total all of these segment totals to a cumulative total in another segment? Is there a way to set a condition to have that automatically passed, so that I don't have to painstaking add a new condition for each of these values? I'll try to find out if this is possible using another a field value instead of a static number that you need to change everytime you change the max value. Are you happy to maintain a separate field/s with a max value? You can keep it hidden, however, you just need to change the default value every time you decide to change the max value. I'll come up with the best solution and reply to this thread shortly. You can expect my reply to this thread. I have further improvised the way you can set Max Points without having to change conditions. Create separate numeric fields with default values for each row. Take a look at my form below. I have created those for the first 2 rows. Have a look at the condition with min() math function. I used a number of fields instead of the static numeric value in the min() function. This means whenever you need to update the max points, you simply need to change the default values of the respective number field. I have kept the max point fields visible in my form, however, you can hide them. How did you put the comma in the equation, can we just type it? Yes. You can type it in the calculation field as you input any other character.